ST. GEORGE — Following are previews of Friday’s four scheduled opening-round football playoff games involving Region 9 teams. No. 1 seed Dixie and No. 2 seed Desert Hills each play at home Friday night, while No. 3 seed Pine View and No. 4 seed Snow Canyon will both be on the road in Northern Utah’s Cache County. The winners of the last four Region 9 titles and one of 4A’s four No. 1 seeds, the Flyers are primed to make a deep run in the state playoffs. After dropping their season opener to Springville, Dixie has won its last eight games, including an undefeated Region 9 campaign. The Flyers begin their state playoff journey on Friday at 7 p.m. against Region 12 No. 4 seed Green Canyon in the friendly confines of Walt Brooks Stadium. “We want to do well (in the playoffs), we like to play at home as well, but in the playoffs, everyone has a chance. We have to be prepared or we could end up being snake-bitten,” Monkres said. 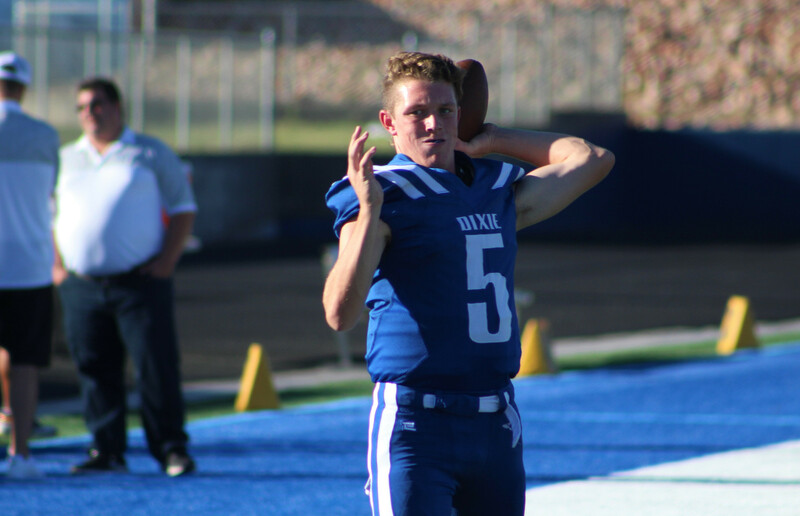 Dixie is led on offense by quarterback Reggie Graff, who led Region 9 in passing yards (1,658) and threw for 14 touchdowns. While the Flyers average nearly 32 points per game led by their star quarterback, the defense is what made the biggest impact for the team. 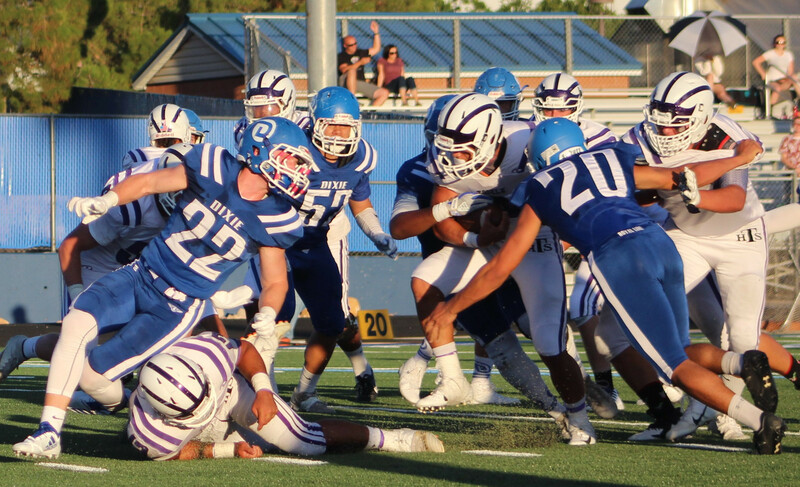 The Dixie defense was outright dominant during the season, surrendering just 105 points in nine games, the best in 4A and third overall in the state. They also led 4A in points allowed per game, giving up just 11.6 per outing. Dixie’s opponent Green Canyon scores nearly the same amount of points per game as the Flyers, but the defense gives up 27.7 points per game, a clear reason why the team is just 4-6 overall. Led by Graff and a strong offense along with a stingy, well-prepared defense, the Flyers look to compete for the school’s ninth state championship and have all the right weapons to make a run. After a coaching change following the 2017-18 school year, the expectations remained high at Desert Hills for new head coach Mark Murdoch. After one season, Murdoch has helped the Thunder continue to be a top team in not just Region 9, but 4A as a whole. They finished 5-1 in region play, 6-3 overall. The Thunder will begin their quest for the program’s third state title on Friday when they take on Region 12 No. 3 seed Mountain Crest at home at 6 p.m. The Mustangs went all the way to the 4A championship game last year. With an offense averaging nearly 30 points per game, the Thunder are well equipped to make a deep run. The offensive attack is highlighted by fullback Kinalea Taufa, who rushed for 850 yards and 10 touchdowns. More than its offense though, Desert Hills relies heavily on its defense, one of the best in the state. The unit is led by defensive end Kaige Baird, the 4A sack leader, and by Bronson Andrus, Region 9’s leader in tackles. Also chipping in is the Region 9 interception leader Dawson Mayfield, all key pieces to an overpowering defense that allows just 15.6 points per game – good for second in Region 9 and third at the 4A level. The game against Mountain Crest will be a defensive battle. The Mustangs (6-4, 2-3 Region 12) allow just 14 points per game, good for 2nd in 4A. 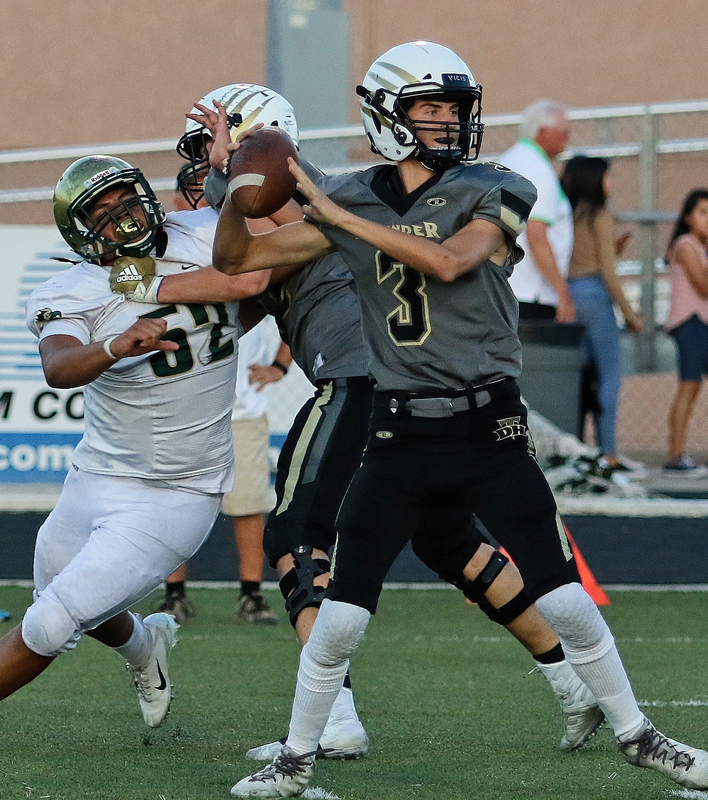 The Pine View Panthers know they have their work cut out for them in Friday’s opening round of the 4A playoffs, when they travel to Logan to face the Grizzlies. The second-seeded Grizzlies have a 9-1 overall record this season, 4-1 in Region 12 competition, their only loss being a 40-22 setback on Sept. 28 at the hands of Sky View, which went on to win the Region 12 championship with a 9-0 overall record. Pine View, meanwhile, finished in third place in Region 9 with an overall record of 6-3. They were 4-2 against region opponents, their only two losses coming against the top two teams in the region, Dixie and Desert Hills. 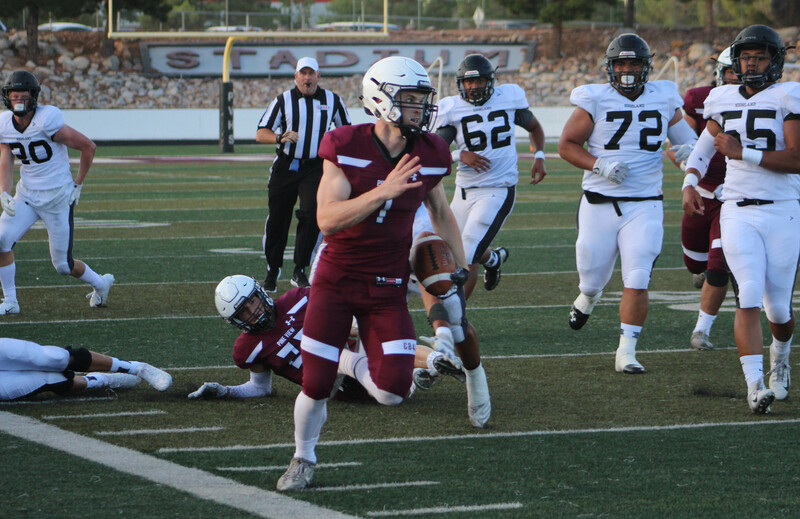 Pine View and Logan were the top-scoring teams in their respective regions, with the Panthers scoring 419 points over nine games and the Grizzlies scoring 301 points in 10 games. Pine View’s defense allowed about 24 points per game, while Logan’s defense gave up an average of 21 points per game. 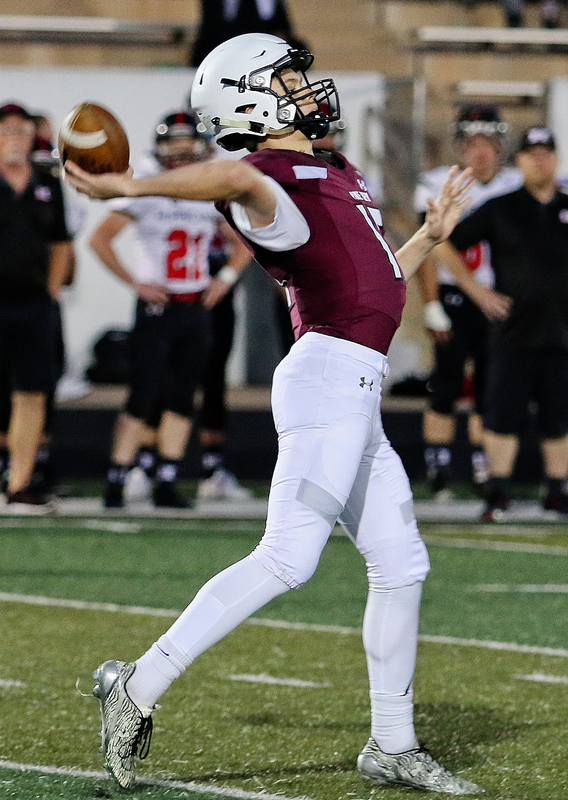 Logan quarterback Jonny Parkinson has been the linchpin in the Grizzlies’ pass-oriented offense this season, completing 197 passes out of 325 attempts for 2,476 yards and 22 TDs. He also accounted for 5 of Logan’s 16 rushing TDs on the season. Pine View, by comparison, also has 22 passing TDs on the season, with quarterbacks Dallin Brown and Macloud Crowton each accounting for 11. But the Panthers have scored 32 rushing TDs, including a team-high 16 by Brown and running back Tosh Wright adding 12. Pine View’s prolific senior kicker Connor Brooksby booted two field goals during last week’s win over Cedar to give him 29 for his high school career, moving him into second place on the all-time list in Utah state high school history, according to statistician George Felt. Brooksby also went 5-for-5 in extra point kick attempts last week, giving him 188 for his career. He is six shy of tying the mark of 194 for second place all-time. Hosner said he and his players are optimistic about their chances at Logan. “We look forward to traveling and bonding more as a team,” he said of the long road trip ahead. “The most important things our kids need to know is that on any given day, the best team doesn’t always win, but the team that plays the best on that day wins,” Hosner said. The two teams have not met since the state championship game of 2005, when Logan beat Pine View for the 3A title, 56-21, when the respective quarterbacks were Riley Nelson and James Lark, both of whom went on to play for Brigham Young University. The scheduled kickoff time for Friday’s game is 4 p.m. The Snow Canyon Warriors are traveling to Smithfield to face the Sky View Bobcats Friday at 4 p.m. Snow Canyon finished its season with an overall record of 4-5, including 3-3 in region play. 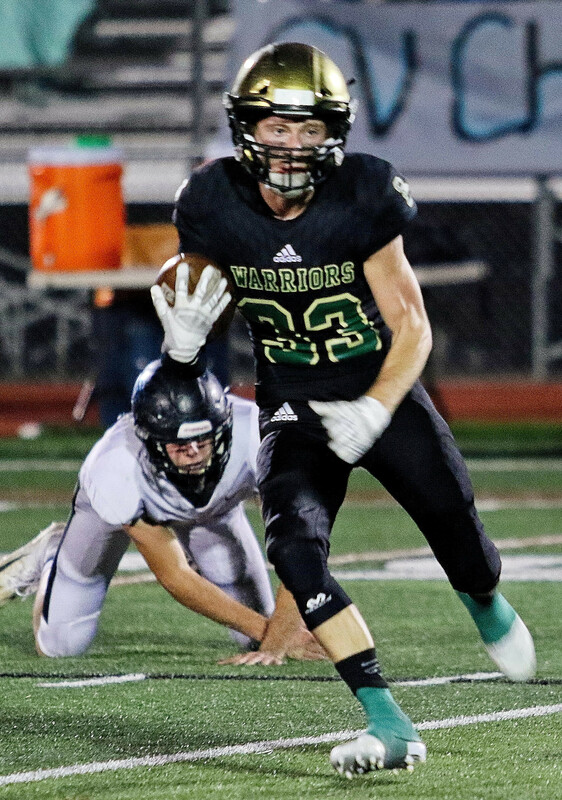 However, the Warriors are riding a three-game winning streak, having beaten Cedar, Canyon View and Hurricane in succession the last three weeks of the regular season. Snow Canyon’s offense produced 14 rushing TDs this season and 9 passing TDs, all thrown by quarterback Landon Frei. Each category had six different players scoring at least one TD, led by Ryan Bethers’ four rushing scores. Sky View’s offense this season has been largely driven by its ground game, with the Bobcats scoring 30 of their 37 TDs via rushing. Tanner Stokes led the way with 171 carries for 1,021 yards and 12 TDs. Esplin also stressed the importance of effective player-to-player communication during the game. “We will need to communicate defensively and make sure we are all on the same page every down,” he said. “We will need to be physical and not make mental mistakes. We challenge ourselves and expect to compete during every down of the game. Editor’s note: Start times for the games at Dixie and Desert Hills were updated Friday at 9:51 a.m. I hope this is a misquote or it was taken out of context. Desert Hills does not need to change to build character, they have always had it. To insinuate otherwise is a slam to the athletes and Coaches that are there and have been there. Coaches Cuth, Nelson, and Franke were all about character, and Coaches Stokes and Cowdin have been there since day one, Coach Bundy served for years, Coaches Miller and the Nunley brothers have been there for years. No changes are needed to build character! Please clarify.